with 14 or 30-day reminder options. 60% of people who over-wear their lenses are more likely to develop eye problems. 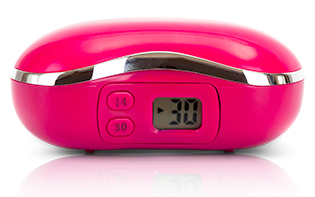 DigiCase digital contact lens soaking case Rubine Red. Includes a FREE years supply of soaking cases. DigiCase digital contact lens soaking case Glossy Black. 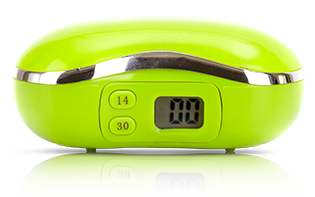 DigiCase digital contact lens soaking case Lime Green. 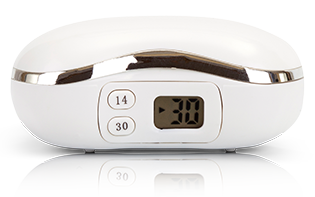 DigiCase digital contact lens soaking case Glossy White. 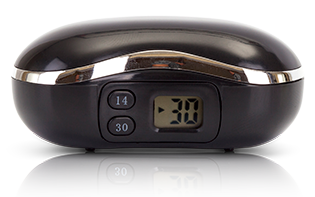 The Digicase contact lens container and holder have been designed exclusively with the regular lens wearer in mind. Digicase are leading suppliers and manufacturers of cases for contact lenses. Our cute contact lens case is ideal for both hard and soft lenses and is an excellent way to not only care for your lenses but to also ensure you never miss the correct time in which to change your contact lenses. The unique electronic reminder that comes with this content lens carrying case has a 14 and 30 day program set which will prompt you as and when your lenses need to be changed. Over 60% of people are over-wearing their contacts which can lead to further eye problems developing. Our contact lens cases and lens holder come complete with mirror for ease of change and lens removal on the go, making these an excellent travel kit or accessory. Our cute contact lens storage cases are available in a range of cool, designer styles and colours. 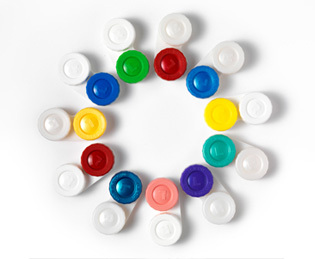 You can buy our contact lenses travel case in bulk and wholesale as we supply to the mass market and to international distributors. 4 x Soaking Cases to be replaced every 3 months.